I have this ongoing stomach thing that I take an army of medication for. Officially diagnosed as "gastritis" it basically means I have to be aware of what things will cause me to internally combust in a horrible ball of pain. It also means that I can't be sure what will affect me. Sometimes I can have something, sometimes not - it's a crap shoot. I drank beer on my most recent trip - no problem. I drank beer the trip before. 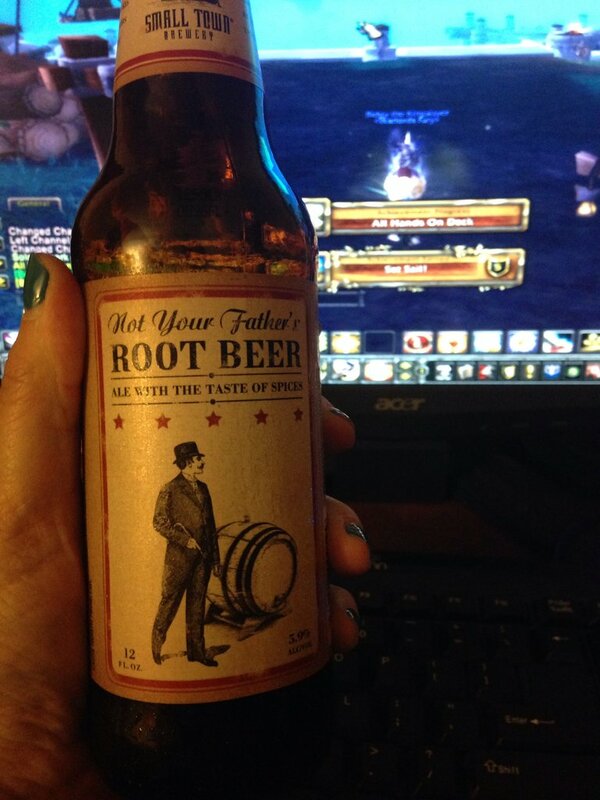 However last night I'd been looking forward to having a beer, this new Root Beer called NOT YOUR FATHER'S ROOT BEER . I gotta go on record to say that THIS is a tasty beverage. It was just delicious, I recommend it HEARTILY to those without stomach issues. I sat down last night at my first real night back home ready to try out the new WoW patch (my shipyard is awesome) and to enjoy just one of these lovelies. I wasn't sure how it would sit, but having just had beer a couple of nights before, I felt pretty confident I would be ok. Right about the time I got to the bottom of the bottle, my stomach said "HEY THIS IS A NO!" It starts out with a sharp centralized poking pain in the middle of my stomach. It grows and burns, until the pain feels like it's actually pushing outward through my back and front simultaneously. It could actually be burning a hole in my spine, based on the pain. I would like a "heads up stop drinking/eating" pain. Like maybe a preliminary burn - or something that would prevent me from filling my stomach with death fire ingredients. But no, it waits until I've crossed the line and then punishes me relentlessly. Last night somewhere after the pain reached it's zenith I started to chill and ache. Why? I don't know. I piled on two sets of pajamas and socks and crawled into bed, I was so cold - despite the hot poker now seeking escape out my back. Julia came and kissed me and told me I would feel all better once I was asleep. I had one sip of coffee this morning, and a bagel -haven't had a damn bagel in forever it was good. I had all my medicine and I'm on my fourth Tervis Tumbler of water. My stomach doesn't hurt, but their is ghost aching going on - barely perceptible but it's there. I'm considering having part of a coffee to keep the caffeine demons at bay but only considering it. I don't know if I made myself an ulcer or it was just the constantly inflamed stomach going on that impacted me. I'm reading about things I can do to reduce my inflammation and thinking I need to try something DIFFERENT. I probably need to go back and do another scope and talk to a doctor about it again. That is a DAMN good beer though. I cannot possibly say how sad I am that I'm not able to drink it. Right there with you. Yesterday I drank a 6 pack slowly throughout the whole day felt fine, bottle was warm by the time I finished it each time. Today I slammed a bottle pretty quick and not too much later ungodly stomach burning pain. Felt the need to vomit but couldn't. I think it may also have something to do with the NYF root beer. I get a sharp stomach pain every time I drink one of those. It's a shame, because it's the best tasting hard root beer I've ever had.